We have been happily very busy this summer, and our blog has suffered as a result! So here is a post to catch us up. Last year was the pilot year for our Alternative Textbook Grants. We had 5 participating faculty. Their adoptions saved students $67,000 in just one semester. This year we are thrilled to have 15 faculty awardees in the grant program. Most of them are adopting an alternative low-cost solution, a few are writing textbooks that will be shared with their students and carry a CC license for use by others. We will be posting more on each of our participating faculty at this blog, but you can read more about them now on our guide. 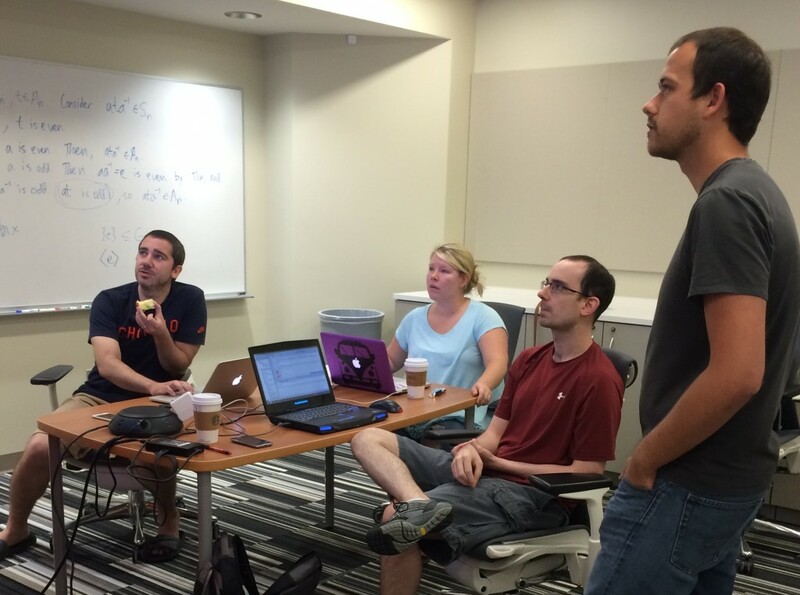 This summer we are hosting our first open textbook sprint. One of our grantees, Dr. Milos Savic had started a textbook on Abstract Algebra with a colleague, David Hren, but never had a chance to complete the book and make it classroom ready. This summer Milos, Dave and graduate student Molly Stubblefield came together the week of June 15th to complete the main content for the textbook. Milos, Dave and Molly working hard on content and Cody is working on getting the LaTeX content ready for WordPress. Cody is working on a post talking about his process – it has been an interesting challenge. The second stage of the sprint is happening next week (July 13th). We will be working on the student support documentation. This will include specific proofs work through by OU Math students during the sprint. We will be blogging next week while the sprint is in progress.